Your compass is a measuring tool that can be adapted to a variety of needs. As shown here, it can be used to measure more than just direction. You can use your magnetic compass to determine the width of a stream or small body of water without having to get wet. This quick and easy method of determining distance using a compass may just come in handy. In any case, it is always a good trick you can use to amaze your fellow survivors. 1. Standing at the edge of the water, sight an object directly across from you on the far bank. Take a compass reading on this object and mark the spot where you are standing. 2. Walk along the stream until the compass reading to the same object across the stream changes by 45-degrees and mark this spot also. 3. Now measure the distance between the two marks you set. This will be equal to the distance between the first mark and the object you sighted across the stream. Say you are standing next to a stream and directly across from you on the opposite bank is a large tree. Take out your compass and sight the tree. Let’s pretend the compass reads 300-degrees (Azimuth type compass) or S30W (Quadrant type compass). Mark this spot and then walk either downstream or upstream until the compass sighting on the same tree reads 45-degrees in either direction from your first reading (either 255-degrees or 345-degrees on an azimuth type compass, S15E or N15W on a quadrant type compass). Mark this position also. 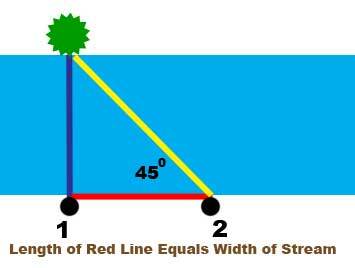 The width of the stream is equal to the distance between your two marks on the ground. If you have practiced pacing (and every survivor should) you can count the number of paces between the two marks and calculate the width of the stream. 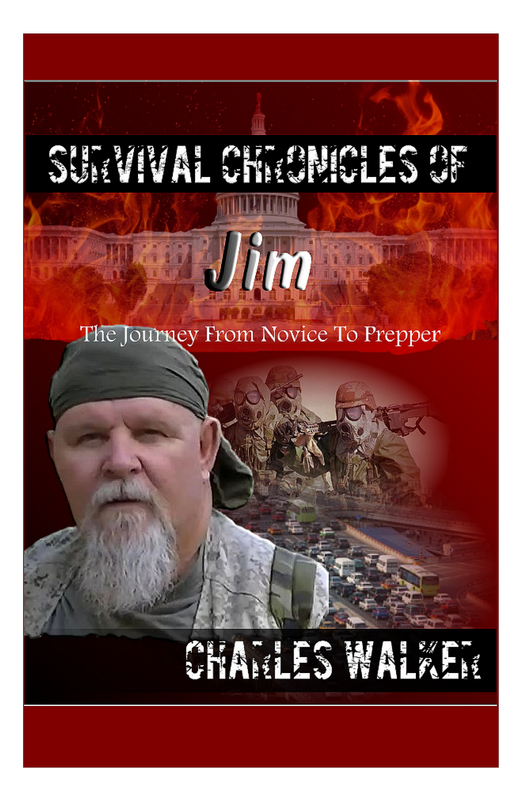 The best survivalists are skilled in using whatever materials at hand in novel ways that give him an edge over his environment. "Thinking out of the box" is a trademark of the true survivor. Quail eat the seeds and use the bush for nesting giving one an opportunity for catching them. As for tea, the dosages vary as widely as the herb itself, so my recommendation is start small, and see how it goes. Maybe 4-6 oz of water with 1/4-1/2 t of herb. You may even want to make sure you’re not allergic to it by testing a small patch of skin with a wash. This herb takes some getting used to…yes, it’s bitter, but you can always add a little honey and see how it goes! Place several Sagebrush leaves (preferably from a small plant) in a cup. Add boiling water, cover and steep 5 minutes. Strain, sweeten and serve. Native Americans regarded this bitter tea useful to promote sweating and to aid in digestion. Many prefer honey or lemon for flavoring. Note that the many species of Sagebrush are not really a sage, but are an annual evergreen shrub. All are aromatic. Camphor is anti-septic, counter-irritant, anti-diarrheic, and cancer preventative. Eucalyptol is anesthetic, anti-bacterial, anti-fatigue, anti-septic, counter-irritant. So what are the drawbacks? Well, there are things to be careful of. If you have allergies to Sagebrush, you probably don’t want it on your eyes! And like any herb, there is too much of a good thing. While there are no toxicity reports, there have been reports of possible liver damage, and inadequate blood clotting after prolonged use. But keep in mind, the very same can be said for something as simple as acetaminophen (aka Tylenol) or aspirin. It’s important to learn for ourselves all that we can, and ask the advise of a medical professional if you are unsure. Better safe than sorry is still the best course. Here is an interesting article from www.herballegacy.com on how to make a tea from sand sage for medicinal uses. I had the opportunity to listen to a tape made many years ago by a student attending one of Dr. John Christopher's lectures. The tape was at least 20 years old, and Dr. Christopher was telling about spending time with an Indian medicine man and chief, who told him that the best way to extract the active principles in desert sage was by making a sun tea. He said that the tea would contain all that a human being needed, without heating it. Then the tape, brittle as it was, broke and was discarded, to my distress, but I still remember what it said. The aromatic smoke of desert sage was also used by the native people to benefit those with rheumatism or arthritis. After a large campfire had died down to glowing coals, these were raked out and dampened desert sage branches were layered on top. The person would then lie down on the sagebrush bed and enjoy the warmth and breathe the aromatic smoke, which was said to help arthritic conditions. “The Western Indians (such as the Navajos) used the Wild Sage (Artemisia tridentata) of the great American Western and Midwestern desert and plains regions for resolving severe body crises such as tumors and cancers. ...The Indians had numerous other uses for the sage...., but its greatest value was medicinal. Sage tea was used extensively as a cure for asthma, taken morning and evening for forty days and at night a sage poultice was applied to the chest and back. Sage branches were burned as a fumigant and the baskets and blankets used during the birthing process were held in the smoke to retain the odor. The Indians believed in the value of sweating in almost all illnesses and so used as a diaphoretic the sage in making a hot tea. A tea from the leaves of the sage bush was adopted from the Indians and became the standard eyewash of the United States Army in the West. One of the remedies for a headache was sage tea or a compress of sage leaves, the leaves being either crushed or boiled. There were almost as many dosages for influenza as there were herbal drugs. The favorites were hot juniper or sage tea and inhaling the fumes from a fire of sage. If one's legs were ailing, weakening, or shaky they were bathed in a hot sage tea, then poulticed with sage leaves. To steady and strengthen mind and nerves, the Indians, as they do today, drank sage tea. ... Sage tea also was used for paralysis. Sage leaves, fresh or dried, were made into a tea for diarrhea, menstrual disorders, and swellings. It had a particularly favorable effect as a tonic after childbirth. Fresh leaves were crushed, strained, and mixed with lukewarm water for stomach distress or were chewed for flatulence or as a tea for indigestion. The powdered herb destroyed worms in children and was so accepted officially in 1840 by the incoming whites. The juice of the herb or its powder was put on moist sores which, with this procedure, were said to dry and heal quickly, as were "green wounds." For numbness of the feet, a wash of sage was recommended, followed by the application of wax and ground nettles. This same sage and wax remedy was used for all foot injuries by the Aztecs. Sage is still used as a shampoo to promote the growth of the hair and also used by the women as a solution to blacken their hair, combing it into their tresses daily. In the case of desert sage usage, it would seem that simple is best. Complex formulas were not part of the lives of the native people, and they used the herbs according to their inherent wisdom and the resources available to them. Desert sage was made into an infusion or concoction, and taken internally, or used as a wash externally. It was burned and inhaled. It was used as a green poultice or made into an ointment, and it was effective. Any statements or claims about the possible health benefits conferred by any foods or supplements have not been evaluated by the Food & Drug Administration, healthcare professional, or even the town gossip. They are not intended to diagnose, treat, cure or prevent any disease. This information is for educational purposes only.